Tofu is and excellent source of protein for vegetarians with over 10 grams per half-cup serving, and is also a great source of calcium and iron. Due to its chameleon-like qualities, affordability and nutritional value, tofu, a staple of Asian cuisines for hundreds of years, has recently become popular in Western vegetarian and vegan cooking. 1. Sliced and diced the tofu,then fry. Once browned and crispy drizzle with Lee Kum Kee premium soy sauce and pepper. Set aside. 2. Saute garlic,onion,bell pepper,chili pepper in a small amount of canola oil in a pan. 3. Add the fried tofu.Season with oyster and hoisin sauce. Before removing from pan, add mayonnaise and all purpose cream. Mix. 4. 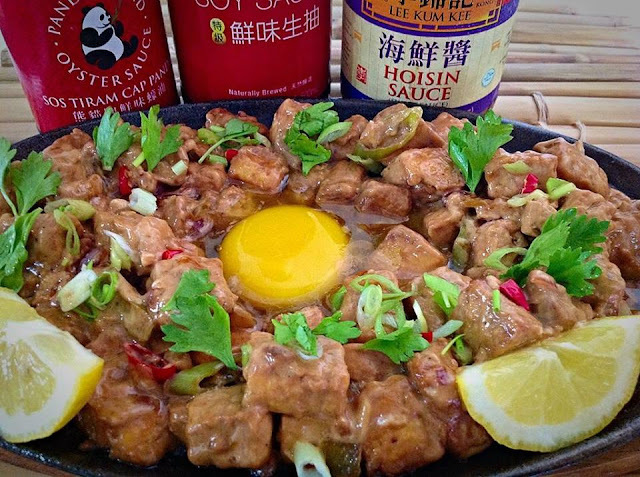 Heat the sizzling plate and add the tofu, topped with egg. Serve hot!